Inspire, Empower and Guide people to their very best… That's what THE SENSEI LEADER is all about! Jim Bouchard now tours the world teaching others how to be THE SENSEI LEADER! 0006 - Dan Pink is Dead Wrong! 0005 Two types of people––leaders––and those who refuse! 0004: How to get people to be open and honest with you––even when they work for you! Take your first step to leadership––or your next step to realizing your full leadership potential. Each episode features ONE STEP you can take on your journey to becoming a better leader and to more effectively serve the people who trust in your leadership. You leave with one idea, strategy or tactic that will help you connect––to ... Maggiori informazioni help you lead by earning the respect, trust and loyalty of the people you serve. More than that, you leave with DISCIPLINES to transform these ideas into real action. Inspire, Empower and Guide people to their very best. Today––take ONE STEP! 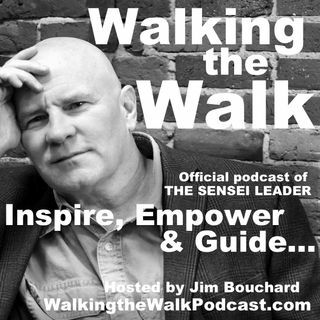 Walking the Walk is the official podcast of THE SENSEI LEADER Program. This is a personal conversation with the world's most effective leaders and influential speakers, authors and leadership experts. We feature leaders from all walks of life and all ... Maggiori informazioni levels––people who are making a real difference in the lives of others through leadership. We also share powerful resources to support you as a leader in your personal and professional life.